Signs are going up along the road sections of the current MST route. Volunteers have fanned out to screw signs into sign posts and paint blazes at road intersections. To date, the signs are up in Bladen, Onslow, Pender, Sampson, and Surry counties. The next step is to install signs in Carteret, Craven and Cumberland counties. And we’ll complete the work this fall and winter in Alamance, Forsyth, Guilford, Johnston, Orange, Stokes, and Wilkes counties. Our goal is to help hikers follow the route and raise awareness of the trail. 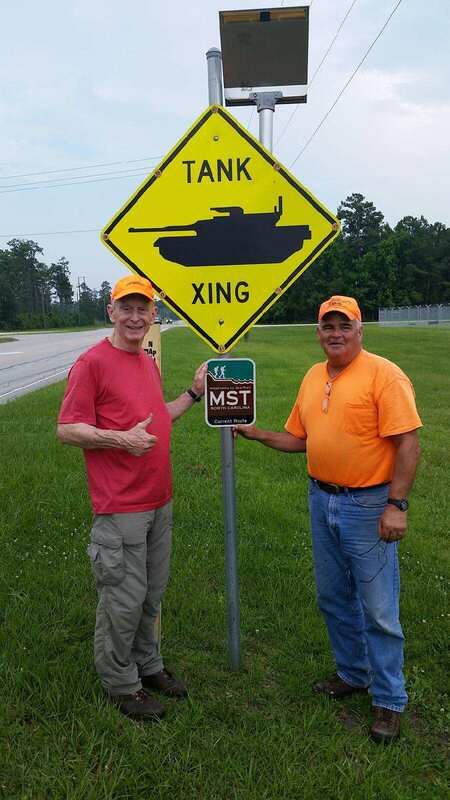 The signs were funded by donors who gave to the MST’s 40th Anniversary Campaign. This project has been more complex than you might imagine. First, the NC General Assembly directed NC DOT to develop a plan which authorized the signs statewide. The next step was to develop a detailed plan for how we would select sign and blaze locations on more than 400 miles of road. Thanks to a grant from REI, we were able to write a manual that staff and volunteers are using to standardize sign placement. Next we set to work with each NC DOT Division to change the generic authorization at the state level into authorization for specific sign locations. The Divisions need to know where every sign is located, and these kinds of signs are only allowed on posts for certain kinds of signs. Jim Grode, our Trail Resource Manager, biked the entire Coastal Crescent route to gps all the preferred sign post locations and identify places where we need blazes to make the route clearer to hikers. He then sent a spreadsheet of information to each NC DOT Division for approval. The final step is to install the signs and paint the blazes. Volunteers have used Jim’s detailed spreadsheet and the manual to find the approved sign posts and blaze locations. On the Coastal Crescent route, Jerry Barker organized a team of volunteers in each county for a “Big Screw-In.” Jerry showed up with diverse hardware needed to handle any and all sign post idiosyncracies (and there are many!). It’s been hot, sweaty and fire-anty work, but very rewarding in the end. 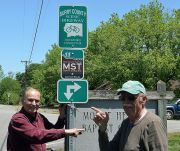 Up in Surry County, Joe Hicks and Bob Hillyer of the Elkin Valley Trails Association have led the work to get NC DOT approval and install the signs. If you live in one of the counties with road signs and you’d like to help install and maintain them, please let Betsy Brown know at bbrown@mountainstoseatrail.org. This is a great way to help hikers and raise awareness of the trail – both at the same time.